This National Register home is conveniently located within walking distance of shops, restaurants and the Ohio River. The Falls of the Ohio fossil beds are a short drive from the Inn along the river, as well as the Howard Steamboat Museum. Louisville, Kentucky is just minutes away from the inn and Churchill Downs, Kentucky Derby Museum, Papa John's Stadium and the University of Louisville. The Old Bridge Inn is conveniently located in the heart of Jeffersonville's Historic District, seconds to the interstates (I-65, I-64, and I-71) Louisville, KY, and within walking distance of antique shops, restaurants and the Ohio River where river boats cruise and carriage rides are available in warm weather. Jeffersonville has what no other local city has and that is a beautiful and accessible waterfront incorporated with a historic district. 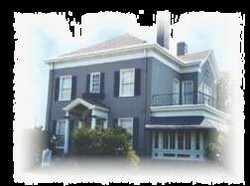 This is the oldest building hosting a bed and breakfast in the region and the only bed and breakfast in Jeffersonville that is truly a historic building. It has not been altered by additions since 1898 and has never been gutted. Many claim to be historic but only the exterior walls or facade are all that remain of many advertised historic buildings. The Old Bridge Inn is truly historic. While modern conveniences like cable television in every room and wireless internet have been added, the integrity of the building has been maintained and remains unaltered. This lavish neoclassical dwelling was erected in 1836 by a prominent local family and maintains most of its original structure. Dr. Charles Hancock, the home’s former owner and a descendant of John Hancock, is said to levitate tea cups and sometimes appear to B&B guests.